FRIENDS OF ANGELS AUTISM FAMILY CAMP is organized and run by Journey South Bay Church. Journey South Bay Church holds a Sunday School class for children and youth with autism each Sunday at the time of the main worship service, allowing parents to attend service without the distraction of attending to their special needs child. The Sunday School program is run by a trained professional who is supported by many loving volunteers. Activities are tailored to meet the interests and abilities of individual children including a joy filled music program. These volunteers and trained specialists are many of those who care for our FOA children during “buddy times” at our Summer Camp. This gives the parents an opportunity to meet with other parents and relax, knowing their children are safe. At camp, siblings also participate in activities and enjoy the time to be themselves and enjoy a typical summer camp experience. Past attendees are happy to answer any questions or provide additional information about their camp experience. Give our office a call if you have any questions. 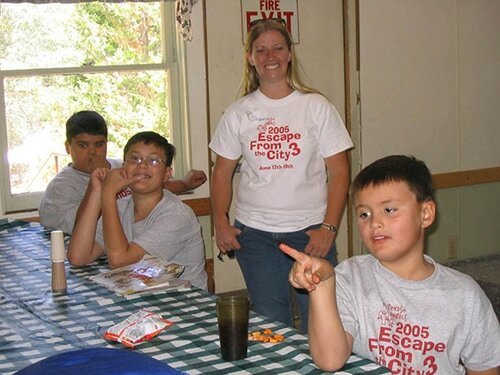 FRIENDS OF ANGELS AUTISM FAMILY CAMP was started in 2003 by a precious family with three autistic boys who had a heart for providing a camp experience for families who would normally never be able to take their unique families on a vacation. It has been lovingly adopted and maintained by Journey South Bay since that time.